Designing the future, highly automated, forestry machines. 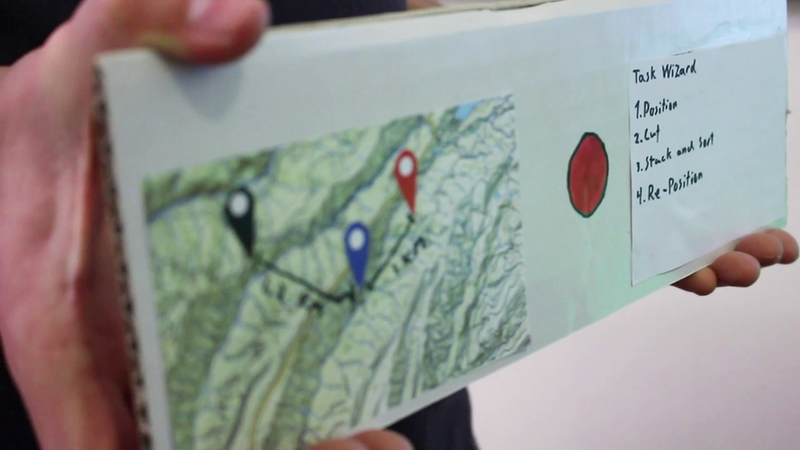 Personal responsibility: Planning of concept development, physical prototyping. Click on left side of the screen to navigate to communication tab. there you can see a overview of the team. You can transition to other screens by clicking on the left and right side of the screen. 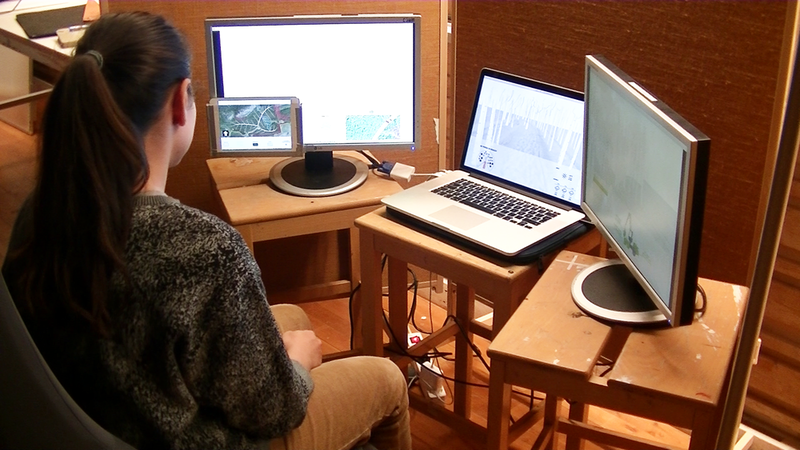 Core to our initial research was to learn about the future users, their tasks and the work environment in a forest. 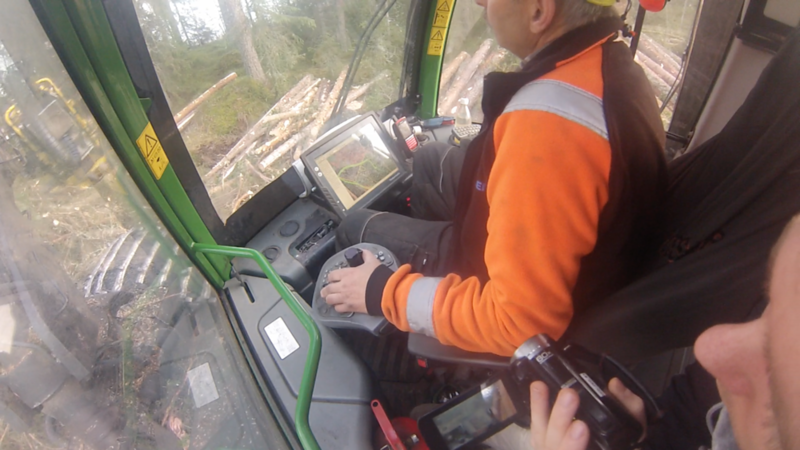 Early on, we were following and observing an experienced operator in a harvesting machine. Harverster operators use their whole lifes learning those machines. They compare a harvesting machine to a plane: The complexity of the tasks that have to be performed simultaneously are so high that it takes years to master the flow of cutting a tree, moving it in the air, debranching it on the way to the pile of logs and sawing it into smaller pieces - all while moving the machine to the next tree. We also meet operators in education at a school for forestry, Naturbruksgymnasium in Burträsk. Speaking with both the lecturer and students, it was clearly stated that especially planning was a challenge, as this task demanded experience and knowledge about terrain, machine and forest. Also some students stated their fear of automation, as they really enjoyed the challenging environment of operating such a powerful machine. Today, a planner scouts the forest area and makes a plan which is given to the operator team. The planning that goes into the work is crucial. Operators should follow the plan from the planner but that is not what happens. Planners usually have no experience driving and operating machines. Hence, they don't get the sense for those kinds of terrains and how it affects the machines. As a result, the operator team has to change the plan according to their experience - something that is rarely fed back to the planners. Those adaptions and changes become even more difficult when they have to be communicated between operators on different day and night shifts. To maintain an efficient and explorative ideation, it was important to set up a frame and structure for ideating. To do so, several ideation methods were used to explore our initial design brief and questions. Moving from the ideation to the prototyping did not mean that the ideation process was over, but it was rather a statement that the ideas now started to take shape, so that they could be tested using the simulator. It is therefore worth mentioning, that the initial prototypes were kept low-fi, to keep them open for interpretation and as explorative as possible. 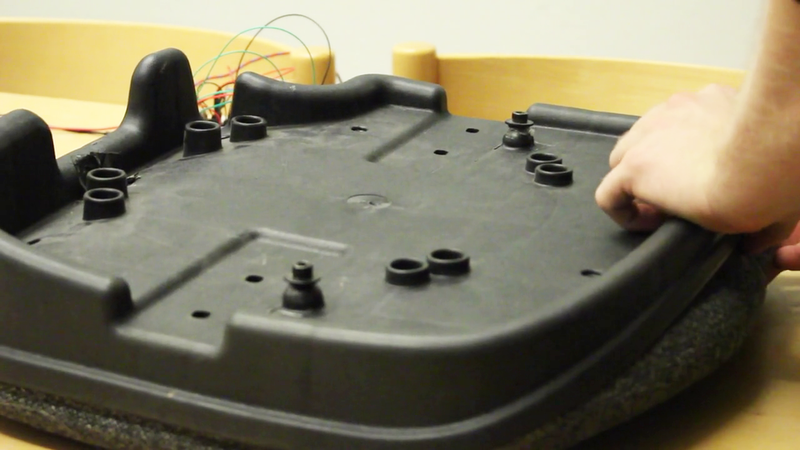 For the user testing, I prototyped a vibrating seat that provides haptic feedback to the user when danger approaches. The seat is made of an office chair where I installed two servo motors that vibrate below the right and left thigh. The motors were controlled by an arduino that allows the vibration to be triggered by buttons. We conducted the user test in a wizard-of-Oz manner. Instead of having a display in floor height, the Assistant (HUD) will display relevant information in front of you. It is situational, meaning that the informations displayed will change according to the task. The ‘seat’ concept was embedded into the other concepts. As working with the physical space within the harvester, the ‘seat’ would try to enhance the presented visual and audio feedbacks. Where the ‘augmented reality’ would highlight a rock, the seat could vibrate in the direction of the danger, so that the operator would know where to pay extra attention. The collaboration platform is a communication tool for all stakeholders that are involved in the process. They can follow the work, get in touch with each other and plan the job together as a team. 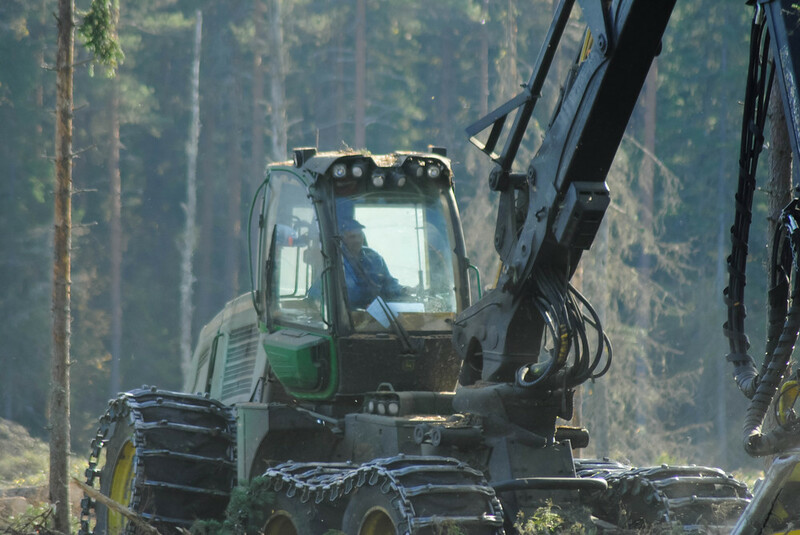 As the individuals played a significant role into the design of the system, concept and design are highly focused on the harvester operator. Currently there are many stakeholders involved in planning the cut. A master planner puts together a team of planners, who will go out and investigate and mark areas for future cuts. A project leader accesses these informations through a database, so that he or she can choose a fitting area for the current demands. When an area has been chosen, the forestry team will be notified and the project leader will send information about the area. Currently the information delivery is very sequential and linear; moreover there is a conflict in the applications used, as there is no shared platform of communication. By implementing the app into this network of people, the connecting links get intertwined and collaboration is encouraged. Everyone has access to a communal platform, that allows collaborative planning and supervision by project leaders and master planners. As seen above, there are also individual benefits, as they get more tools to plan, communicate and revise changes.